Farmer’s markets, overproducing gardens, neighbors who surreptitiously leave zucchini on your front porch, herb beds out of control! If you are so blessed, how do you deal with a bounteous summer harvest? Come this Sunday, #SundaySupper is here to help! On Sunday I am cohosting Sunday Supper with my friend and fellow blogger, Heather from Hezzi-D’s Books and Cooks because the theme is one we are rather fond of, Saving Summer Harvest. If you’ve been reading along for at least a year, you might recall that I cohosted the same event last summer. 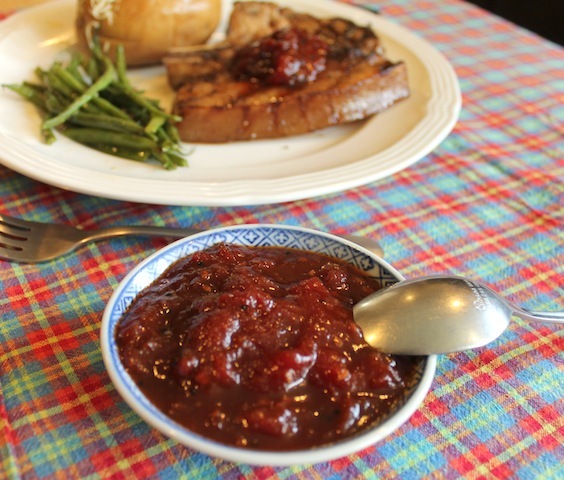 And if you've been around even longer, you'll remember that Heather hosted it in 2013 when I shared my spicy sweet tomato chutney recipe (photo above) and she made Mixed Berry Rhubarb Jam! If you are scared of preserving your own produce, or think it is just too hard, this is the Sunday Supper for you! While I was growing up, my grandmothers and all of their contemporaries canned and froze and made preserves all summer long, usually fruit or vegetables from their own gardens. I’ll be honest, it looked like a lot of hard work (because it was!) so I avoided it for many years, until it occurred to me that I could do small batches, what my friend Kelli of Kelli’s Kitchen calls nano-canning. Well, I didn’t have a name for it back then, but two or three or five jars instead of 20 seemed do-able. Another turning point for me was learning how to vacuum seal my jars without actually using the hot water bath. I know this technique has its naysayers but for anything with a high sugar content and/or some acid like lemon juice or vinegar, it works just fine. Especially since, if you are making it on a small scale, it will get eaten relatively quickly. How do you Save Summer Harvest? There are myriad ways of preserving produce: salting (think capers and anchovies), smoking (red peppers ground into paprika), infusing (chili oils or fruit vinegars) not to mention canning (which could include sugar, salt and vinegar, all of which are great preservatives), dehydrating (for herbs and fruit), freezing (for most anything!) and the ever popular pickling, whether by fermentation or the addition of an acidic liquid like lemon juice or vinegar. And let’s not forget straight fermentation without which we would have no blue cheese or Camembert, wine or beer! Last but not least, some ingredients can be preserved by enclosing or covering them in fat, for instance, potted shrimp, duck confit, compound butters, pestos and roasted peppers. And while I’m sure that list seems long, I’ve left a few out, some which are ancient, like burying ingredients, for instance century eggs which are enclosed in mud which causes them to ferment rather than spoil, or more modern techniques like vacuum packing. The one goal all these methods have in common is to make the best use of what we can grow or buy when it’s in season and make it edible into the next, so we don’t have to waste anything. And that’s what we are going to help you do on Sunday. Please check back then when the links to these great Saving Summer Harvest recipes will go live and I’ll be sharing my own cherry lemon jam.